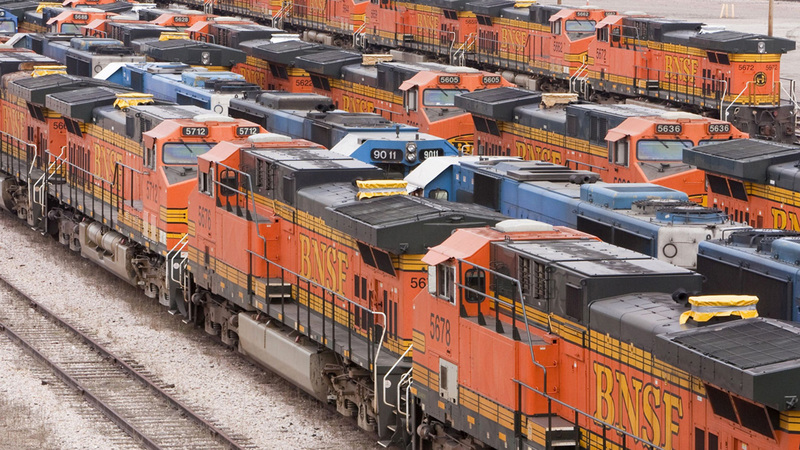 North American carload and intermodal traffic again declined compared to 2018, according to figures for the week ending March 16, 2019 released by the Association of American Railroads (AAR) on March 20. Total U.S. weekly rail traffic was 501,001 carloads and intermodal units, down 6.8% compared with the same week last year. Total carloads for the week ending March 16 were 240,317 carloads, down 8.8% compared with the same week in 2018, while U.S. weekly intermodal volume was 260,684 containers and trailers, down 4.8% compared to 2018. Two of the 10 carload commodity groups posted an increase compared with the same week in 2018. They were petroleum and petroleum products, up 2,122 carloads, to 12,124; and motor vehicles and parts, up 806 carloads, to 17,926. 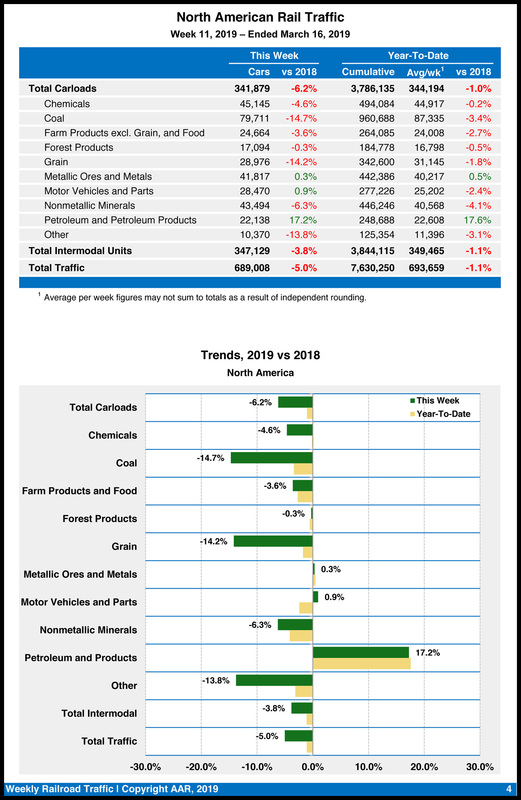 Commodity groups that posted decreases compared with the same week in 2018 included coal, down 13,701 carloads, to 72,190; grain, down 5,148 carloads, to 18,619; and nonmetallic minerals, down 2,532 carloads, to 32,730. 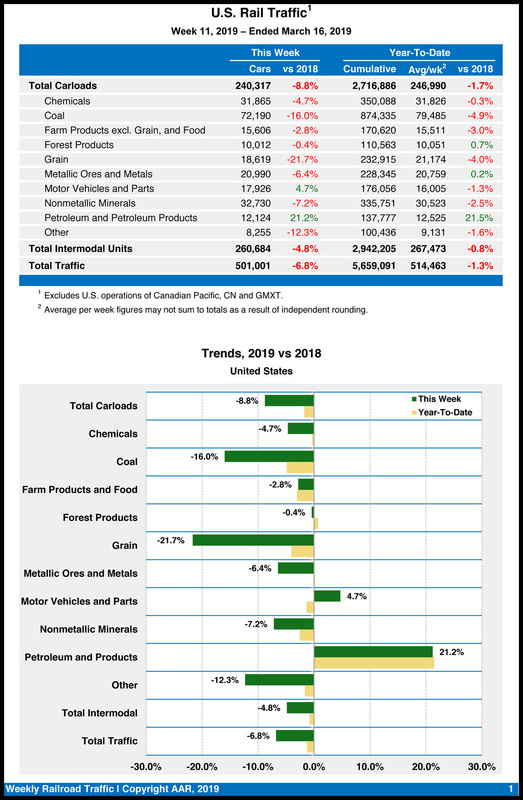 For the first 11 weeks of 2019, U.S. railroads reported a cumulative volume of 2,716,886 carloads, down 1.7% from the same point last year; and 2,942,205 intermodal units, down 0.8% from last year. Total combined U.S. traffic for the first 11 weeks of 2019 was 5,659,091 carloads and intermodal units, a decrease of 1.3% compared to last year. North American rail volume for the week ending March 16, 2019, on 12 reporting U.S., Canadian and Mexican railroads totaled 341,879 carloads, down 6.2% compared with the same week last year, and 347,129 intermodal units, down 3.8% compared with last year. Total combined weekly rail traffic in North America was 689,008 carloads and intermodal units, down 5%. North American rail volume for the first 11 weeks of 2019 was 7,630,250 carloads and intermodal units, down 1.1% compared with 2018. Canadian railroads reported 79,303 carloads for the week, down 0.01%, and 69,935 intermodal units, up 1.9% compared with the same week in 2018. 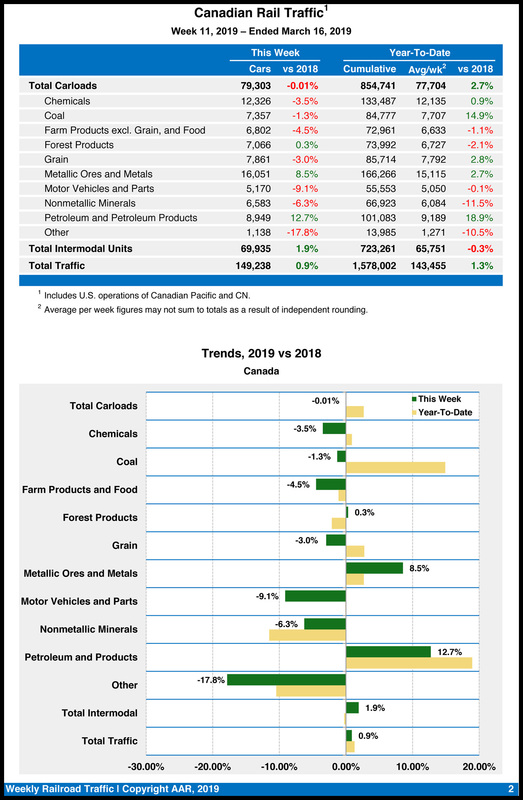 For the first 11 weeks of 2019, Canadian railroads reported cumulative rail traffic volume of 1,578,002 carloads, containers and trailers, up 1.3%. Mexican railroads reported 22,259 carloads for the week, up 2.4% compared with the same week last year, and 16,510 intermodal units, down 10%. 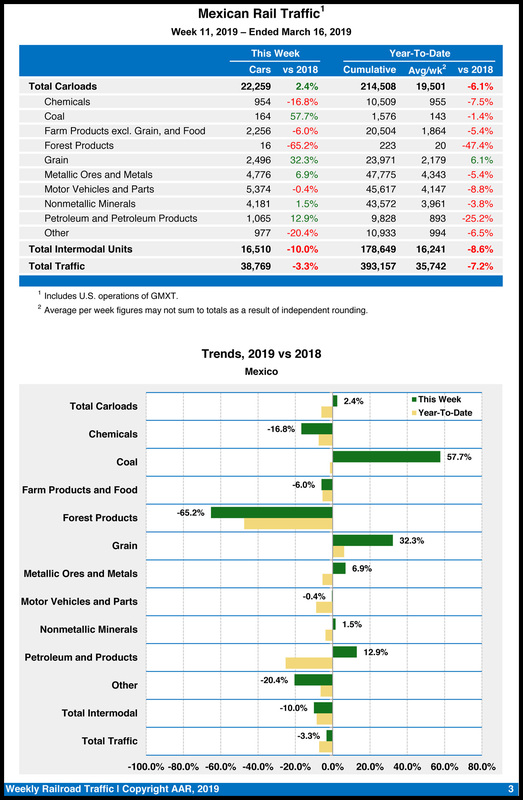 Cumulative volume on Mexican railroads for the first 11 weeks of 2019 was 393,157 carloads and intermodal containers and trailers, down 7.2% from the same point last year.